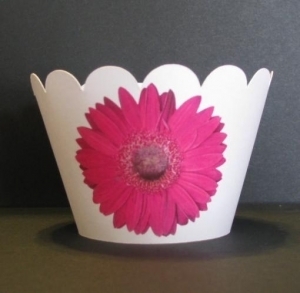 What a delightful touch these gerber daisy cupcake wrappers would add to your event. Sometimes it's the little things that make a big difference. Please tell us the color you would like your daisy to be in the text box provided. These cupcake wrappers are not for baking. They are used for display only. Our gerber cupcake wrappers have a tabbed end that fits into a slit on the other end; very easy to put together although we also include a 'how to sheet'. Wrappers measure 2 1/4" to the top of the scallop.